During Miami Art Basel, Young Thug is teaming up with Netherlands-based artist, Hajar Benjida for their SCOPE Miami Beach installation, "Young Thug As Paintings," an iteration that Benjida originated on Instagram (@YoungThugAsPaintings). Originally a school project, Benjida’s "Young Thug As Paintings" pays homage to the cultural capital of Thug, by juxtaposing him with some of history's most revered works of art. Each combination offers a glimpse into Young Thug’s fluid sense of style and musicality. "I jokingly answered an interview question with "I hope to discuss renaissance paintings with Thug someday." 1.5 years later and I’m bringing my project to life together with Young Thug himself," stated Benjida. The exhibit will be available for viewing December 4th through December 9th at the 18th Annual SCOPE Miami Beach Art Fair. SCOPE is one of the most important satellite art fairs that takes place during Miami Art Basel. The exhibit is sponsored by Young Stoner Life Records and 300 Entertainment. 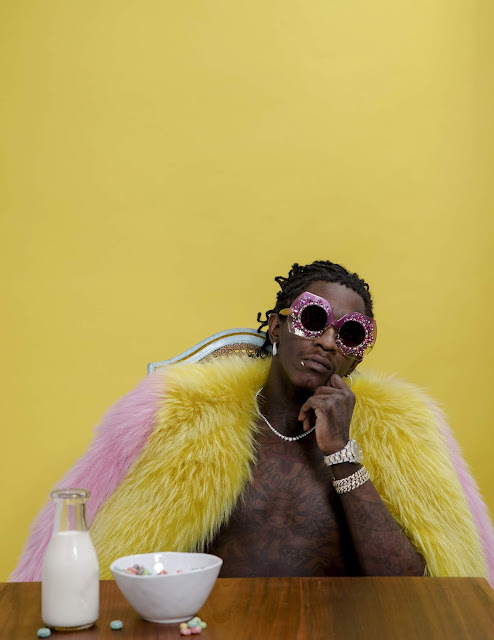 "Young Thug is one of the most profound artists of this generation and we're going to continue to celebrate him in the most innovative ways. Hajar Benjida's display of Thug's influence through art disruption is incredible. This is also a celebration of Hajar's talent and her appreciation of the culture," says Rayna Bass, Head of Cultural Marketing at 300 Entertainment. Thug's exhibit comes shortly after the release of his latest EP, On the Rvn, which featured surprise appearances from Elton John, Jaden Smith, 6lack, and Offset.